...Flashbacks reveal how Rene went from being a simple family man to a vigilante named Wild Dog. Meanwhile, Oliver must deal with the perpetrator behind the attack and realizes the best way to do so is as Mayor Queen instead of the Green Arrow; and tensions run high in the Arrow bunker. 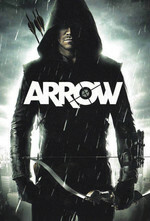 Den of Geek review - Arrow takes on gun control in an episode that focuses on the origin of Wild Dog. I suppose I should give Guggenheim some credit for attempting to broach a serious subject on Arrow, but, there was just too much straw-manning for me to take. I'm just gonna go out on a limb and say the show about a mass murderer (but he uses a bow and arrow!) was the wrong vehicle for this message. I thought they did a nice job of not setting anyone up as the Obviously Wrong opinion and the various Team Arrow sides in the debate didn't get given perfect dialog. Mad Dog could very easily have told Curtis uh dude, we go out in the world with weapons and do vigilante justice, do you think maybe you're being a big giant hypocrite with regards to restraining access to guns because people might be bad with them? I'm glad the writers didn't suddenly make him more eloquent just to get stuff like that in. Overall I could have lived without it but if you're gonna do it I think they did it reasonably well. It felt like a cop-out to me. The Star City Firearms Freedom Act (or whatever it was called) didn't limit the ability to buy or carry guns or use them as protection. So what did it do? Apparently nothing. Look, I get that a show like this can't come down in favour of one side of the gun debate or the other (for an assortment of reasons) but that bit where Oliver gave the councilor the proposal he and Rene drafted really read as if he had just rolled over for the purpose of getting her to agree to something just so that they'd have a good political moment, even if it was an ordinance that had no teeth or no power. Maybe if they had shown her to say, "well I don't like this bit but I can see that it's fair" it would have worked better, but her just doing the "I'm signing this so I can hold it over your head" threat didn't do anything to show that she had capitulated or bent in any way. I don't know if the bit about people with dishonorable discharges not being able to have guns is true (somehow I suspect it's not) but assuming it works that way in this universe, shouldn't somebody be gunning for Rene's head (or at least his letter of resignation)? I know they need a place to put him that's outside of Team Arrow, but I really don't like him working at city hall. It just doesn't feel right. I like that they tried to do a more serious show about a complicated topic (unlike say, just firing off random nukes for kicks) but this really seemed like a swing and a miss. "The Star City Firearms Freedom Act (or whatever it was called) didn't limit the ability to buy or carry guns or use them as protection. So what did it do? Apparently nothing." Uh, yeah, how did they come up with this miraculous legislation or whatever it was? Does it do anything? Is there any point? I second the "this is not the vehicle to do an anti-gun episode about." It's just weird doing it here. That said, it wasn't nearly as terrible as I would have expected. It's...okay, I guess, in some respects. But mostly awkward. On the other hand, I was happy not to see more Oliver flashbacks, so there's...that, I guess. I would gladly take Oliver flashbacks over Rene flashbacks. I really dislike that character. I'd have been much happier to keep Ragman (even a depowered one) and lose Wild Dog. I realize it's problematic to do a gun control episode on a superhero vigilante show, but given the origins of the character, it should be possible. If this incarnation was the traditional rabid left-wing commie-pinko (to the people who don't like him) firebrand loudmouth Ollie from the comics instead of the moping, broody, angsty, emo, Bruce Wayne wannabe Oliver, a gun control episode would be a natural fit. As it stands, given the desire not to lose half the audience (either the pro or anti gun control demographic) and the way they've set up the characters, I suspect it was the best they could do. (Although the AV Club review was right, Felicity should have been given a chance to speak her mind about the topic, given her history with gun violence.) Honestly, I was surprised they even tackled the subject at all. This week on a Very Special Episode of Arrow: Oliver and his vigilante friends topic the vexing topic of Gun Control. Marvel as they discover a solution to one of the great debates of American society, where they provide the pretense of addressing the American Exceptionalism of gun violence while not actually limiting the rights of the gun industry to sell mass killing weapons to American citizens. Special guest appearance by Rick Gonzalez, whose wife's tragic murder at the hands of a drug dealer with a gun turns him into Advocate #1 for Gun Ownership. Next week on Arrow.. a troubled young man murders 20 elementary school children with his mother's legally owned murder toy. Will Team Arrow leap into action to save further children at peril? Stay tuned to find out! To the extent that anything on superhero shows makes any sense, I took it to represent - however hand-wavey - an idea that it's possible to have a dialog and let go of extremes long enough to come up with compromise legislation. Perhaps I am simply primed to believe in this unicorn as a pro-gun control gun owner who loathes the NRA and similar anti-anything forces. But I don't much mind the portrayal of doing that without getting into the details of what it is. This was the worst Arrow episode I've seen to date. It was toothless, mealy-mouthed, preachy, and gross. And to get there this week?? Ugh.